Press Release for New Book! Serial Entrepreneur Announces New Literary Format; “Prose/Art Exposition”, Helping Readers Navigate the Road to True Happiness. 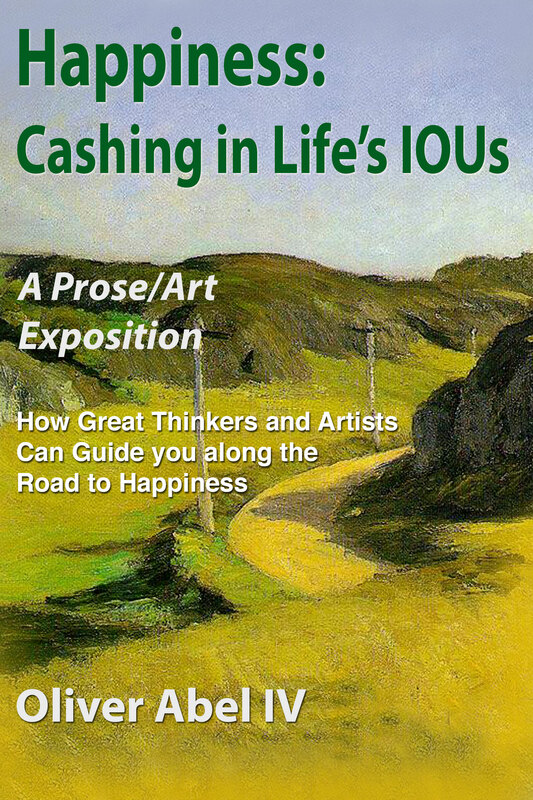 Written by Oliver Abel IV, “Happiness: Cashing in Life’s IOUs” weaves together the worlds of psychology, philosophy, myth, the fine arts, and contemporary entrepreneurship into a ground-breaking new format coined “Prose/Art Exposition”. With his book helping readers answer five of life’s toughest questions, Abel’s work is poised to resonate with people around the world. New York City, New York – There’s no denying that everyone wants to reach true happiness. However, while it may appear to be easier said than done, a compelling new book by Oliver Abel IV lays out the definitive roadmap to reaching this bold achievement. The success of “Happiness: Cashing in Life’s IOUs” emanates from a groundbreaking new literary format designed and refined by Abel himself. What is the roadmap to happiness? Is the roadmap reliable, can it be trusted? If I reach happiness, what can I expect when I get there? What is the vehicle for traveling along the road outlined by the map? With so much attention on achieving happiness, how does society flourish? The “prose” is a synthesis of well-known ideas of three modern thinkers, leaders in their fields of psychology and classics, and four esteemed ancient philosophers. The “art” represents 78 works of great artists, poets, composers, and choreographers of the last 500 years, translating the “prose” into human feelings. As the author explains, Prose/Art Exposition is more than a modern buzzword. “This is the real deal; it’s an innovative device to deliver the roadmap to happiness. Everyone is in one of six galleries and each reader will discover which one they currently belong to. Most importantly, they’ll leave the exposition enlightened by an enriching display of life’s journey and inspired to harness the vehicle – the entrepreneur within each of us, to follow the lessons learned and travel forward to other galleries to reach happiness and the flourishing of society,” says Abel. With Abel as their curator, those with busy lives will find all ideas and artwork already sorted to uncover a visible roadmap that anyone can use as they travel along life’s journey. With the book’s popularity set to rapidly increase, interested readers are urged to purchase their copies as soon as possible. ‘”Happiness: Cashing in Life’s IOUs” is available now: http://amzn.to/1g5dccc. The author has an MBA from Wharton and has spent the last 35 years as an entrepreneur. His career has taken him to Wall Street and into the operations of dozens of small businesses. This entry was posted in Uncategorized and tagged book press release, entrepreneur, Fine art, fulfillment, happiness on September 17, 2013 by oliver. Thanks for the nice comment on my blog. Please let me know if there is anything you would like me to discuss.